With the development of the world economy, many countries begin to pay attention to the recycling of natural resources. And with the rapid development of infrastructure project, in order to replenish the need of sand market, manufactured sand has become the first choice for engineering construction. So the demand of various sand making equipment rises continuously, Zhengzhou YIFAN -as the leading manufacturer of professional stone (sand) production line, increases the technology content constantly in processing to create leading brand in crushing and screening industry. At present, the 150t/h basalt crushing production line created for Sri Lanka customers proves its high performance and professional brand. 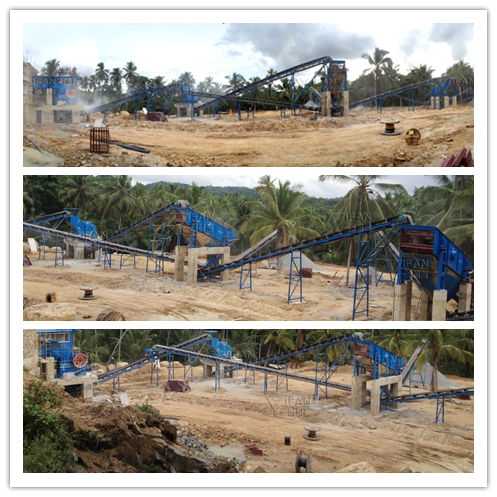 The 150t/h basalt crushing production line applied in Sri Lanka is mainly consisted of vibrating feeder, jaw crusher, impact crusher, vibating screen, conveyor belt and centralized control equipment etc. This stone production line has the features of small floor space, high investment economy benefit, high quality crushing materials, low powder productivity etc. The operation procedure is reasonable: first, raw material is crushed by jaw crusher, it is called coarse crushing, then the coarse aggregate is conveyed to the impact crusher by conveyor belt to be crushed again. The crushed material is screened into three kind size of sand, stone and bigger stones, and then back to the impact crusher be crushed again. In order to make sure the discharging is unobstructed, YIFAN equipted advanced electric control operating system for Sri Lanka customers. The 150t/h basalt crushing production line wins good reputation from Sri Lanka customers depend on its good quality, reliable operation and advanced technology. The products manufactured by YIFAN has become the mainstream brand products and the most trusted brand products. Yifan Machinery is China's leading supplier of crushing and screening equipment, complete sets of equipment have been exported to Australia, Russia, Mongolia, Central Asia, Africa, Europe, America and other countries and regions. If you want to buy crushing and screening equipment can contact our online customer service or send me a message for the latest information on products offer.